For the last few months my son has been getting up earlier and earlier. Like the birds, he believes that he should get up as soon as the sun rises, which makes him tired and grumpy early in the day. In an attempt to teach him what time he should get up at I’ve found 6 clocks that use different ways to show your child the proper time to wake up. From changing colors to sleepy animals, each company has their own way of showing what time your little one should get out of bed. time, as well as look for the arrival of the sun! BabyZoo Sleeptrainer($35) – This unique and cute Sleep Trainer shows in an intuitive way when your child is allowed to get out of bed or still needs to catch some sleep ~ Eyes Closed – “I should be sleeping”, Eyes Open -“Rise and shine!”. The solution for early rising children!! How does it work? At bedtime, show your child that Momo is going to sleep. With one push on the button you close Momo’s eyes and explain to your child that as long as Momo is sleeping he/she needs to stay quiet and try to catch some more sleep. Only when Momo opens his eyes, it is time to wake up! Teach Me Time($40) – American Innovative’s Teach Me Time Talking Alarm Clock and Nightlight features a color-changing nightlight that teaches kids to stay in bed until it’s Ok to wake; parents program “Ok to wake” time, when glow changes from yellow to green they can get up. For children 7 and above, Teach me Time! is a fully functional alarm clock with a snooze function, just like mom’s or dad’s. Stoplight Sleep Enhancing Clock($40) – The Stoplight Sleep Enhancing Clock features a friendly, beautifully-crafted sculpted figure next to a stoplight. The stoplight features red and green lights that can be easily set by parents. A digital clock and optional beeping alarm function are also included. When the red light is on, kids will understand that it is still time to sleep. When the green light turns on, kids will know that it is time to get out of bed. Good Nite Light($35) – This friendly looking clock shows that it’s time to rest by displaying an easily recognized “Moon” caricature. Kids quickly come to associate the dim unobtrusive moon image with the knowledge that it is still bedtime and they should go back to sleep. 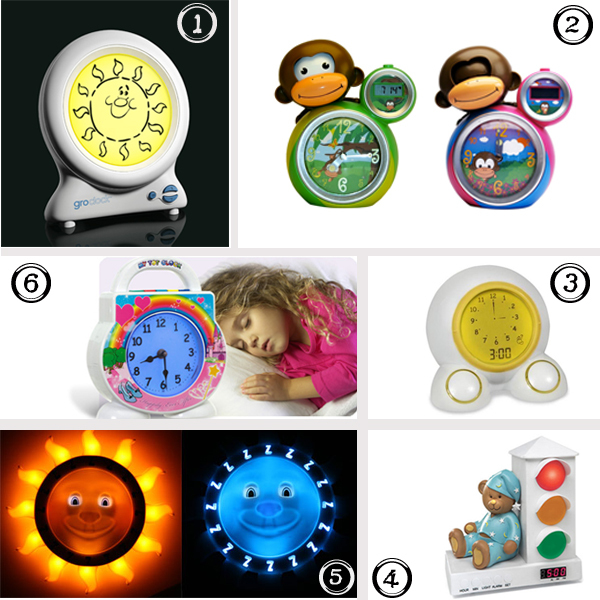 At the time you choose in the morning, the Good Nite Lite will brighten and display a cheerful “Sun” caricature letting the child know that is time to wake up and alright to get out of bed. During the day, the Good Nite Lite automatically shuts itself off to eliminate any distractions and to conserve energy. My Tot Clock($50) – This fun clock is the first all-in-one sleep clock, alarm clock, nightlight, timeout timer, and activity timer for tiny tots who can’t yet tell time. The magic of My Tot Clock is that it changes color to teach little ones when it’s time to sleep (blue light) and when it’s okay to wake (yellow light). Parents set the routine! My Tot Clock, with its child-friendly analog clock display, also plays bedtime stories, lullabies, fun wake-up music, and even white noise to make the traditionally stressful bedtime and morning routines more enjoyable. Blue light is not good for sleeping – it disrupts the natural sleep cycle.